Aliviar is not a big-name bar like some of the others in “Measure and Stir’s Magical Mixological Journey in the Land of the Rising Sun(tm)”. In fact, it is in every way a neighborhood bar, the little convenient watering hole that you visit for a nightcap after a long night of hard drinking… Man, I know how that sounds. They made it onto this list because they were on the ground floor of the building where my AirBnB was located in Ebisu. Unfortunately for Aliviar, there are two other bars in Ebisu that you should probably visit first, but that is in no way a slight against them. 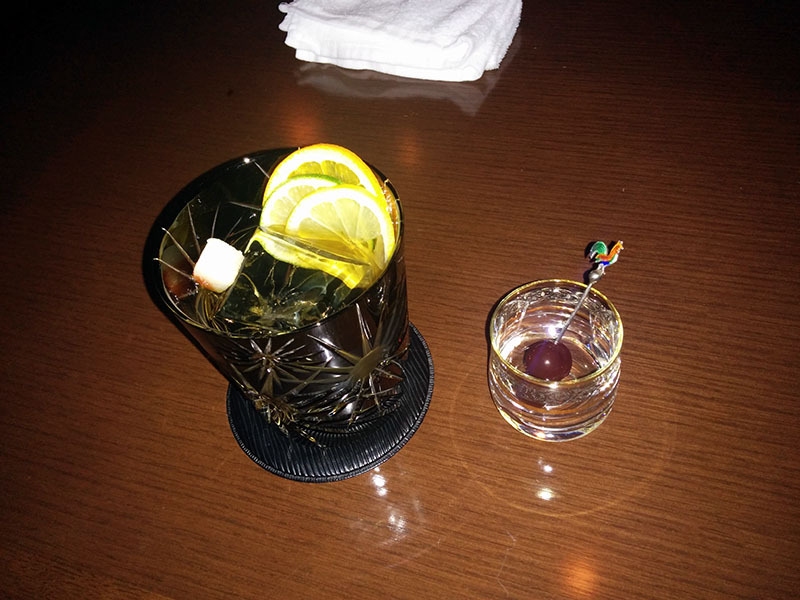 Aliviar is small, classy, welcoming, and everything that you would expect from a Japanese cocktail bar. The bartender’s movements are precise and elegant. Like most cocktail bars in Japan, the glassware is of a quality that puts any bar in the USA to shame, even the top bars in New York and San Francisco. I mean that, the Japanese have taken barware and glassware into the stratosphere, and meanwhile here we all are, still stuck on the ground. Personally, I like to make mine with an egg white. With apologies for the poor photo quality. Anyway, the bartender at Aliviar served such a beautiful Old Fashioned that I had to write about it, though I will note that the strange Japanese practice of placing a bitters-soaked sugar cube on top of ice instead of integrating it into the drink meant that he basically served us a whiskey on the rocks. And Aliviar’s bourbon of choice? Wild Turkey 101. Categories: excursions | Tags: alcohol, bar, bars, bartending, booze, cocktail, cocktails, craft cocktails, drinking, drinks, liquor, mixed drinks, mixology, spirits, tokyo | Permalink.